last year, much in love with saturdays because they signal the end of probably a long week, i figured that the ideal way to celebrate this temporary freedom was the way that we all celebrate: bike ride. the overhang from days sat in front of a tft screen engender feelings of drowsiness even after a reasonable night's sleep, and the day's watchword was the lethargy you just don't need after kitting up and heading off. to encompass this within the hastily fabricated training plan, the idea was to pedal off south into the sunrise, and double back on the kilometres to head west for a soya cappuccino and whatever sticky buns were made available as accompaniment. not very far, as the crow flies, so little need to stock up with a larder of carbo bars and water bottles topped up with similar, but in liquid form. no point in adding unnecessarily to the cargo bay. but cycling gives those sleeping endorphins the very kick up the backside they so richly deserve, and by the time i'd reached the turning point, i was rather enjoying the bike ride, so kept on to the next interchange on the motorway. now this would not have added greatly to the kilometreage, so at that point, no real need to regret those vittles; except the happy bits were getting carried away with themselves, and a trip up the mountain didn't seem such a bad idea. sun, headwind and carbon fibre: what more could a weekend warrior desire? at this point, the rather obvious fact that the further out i went, the further there was to come back, was being unceremoniously ignored, and by the time i reached the cappuccino shop, while thirst was not of major concern, the lack of a few extra carbohydrates was beginning to give cause for concern; the cappuccino shop is still 15km from home. beverage ordered, the sight of double choc-chip muffins was more than a honed athlete with depleted energy could ignore, and it was not long before my table consisted of dregs of foam and muffin crumbs that bore witness to a feeding frenzy. this may seem largely unconcerning to most of you but needs to be qualified by my pointing out that even on a good day, choc-chip anything would be considered anathema. i am not a chocolate fan. suitably fed and watered, i regretted the muffin purchase for every one of those 15 kilometres on the wend homeward. a lesson, if lesson were needed, to do the boy scout thing and be prepared, even if a short bike ride is all that is on the agenda. there are probably as many carbo bars and powders on the market as there are shiny carbon frames, so while choosing an effective partner is unlikely to require resort to nutritional science (that's their job), finding something that you like can be a bit iof trial and error. it's the same with drumsticks, i'm sure you are consoled to hear. bars can be sticky and sweet: not a criticism itself, but one that comes home to roost if you have to guzzle more than a few over the course of a day or two, so i find myself drawn to bars that don't require the jaw muscles of a great white, and flavours that have a twist of the natural about them, which rather neatly brings me to bikefood's date and brazil nut bars with added guarana. no, i had no flipping idea what guarana was either, but it turns out to be a member of the maple family, growing in the amazon basin, and rather common in brazil. the fruit of the plant is a noted energy booster. box ticked. this would have been a far more effective source of fuel during my over-active and undernourished saturday jaunt than a (double) choc chip muffin. 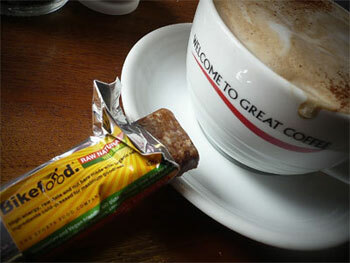 some stuff just has the word appealing written all over it (metaphorically, not figuratively) and i rather favour the bikefood munchy bars currently occupying one of those three back pockets. and as to liquid refreshment with the ability to maintain those colossal speeds regularly achieved down uiskentuie strand (preferably with a headwind of choice), water has the dehydration factor covered, but isn't overwhelmingly flavourable and enticing. i have previously used bikefood orange energy drink mix, which is pleasant enough, but as someone who drinks little else but fresh orange juice, i rather prefer an alternative flavouring in my water bottle. this has been addressed within the bikefood family by the introduction of berry flavour: luvverly, though something just a little less sweet would suit my taste buds. condition this by noting that grapefruit juice and lemon juice find favour here. a 500g tub ought to provide around ten complete servings as the label would have it, depending of course, on your individual taste. but as alluded to above, it's their job to be the nutritional scientists and figure out what the athlete within requires to be brought to the surface, so in most cases i'm inclined to follow the label. the measured amount provides a flavour just shy of the strength i'd enjoy while standing in the kitchen, but then entering the last hairpin on alpe d'huez, i have to confess it's likely on the right-side of just right. you should always do what your mother tells you. 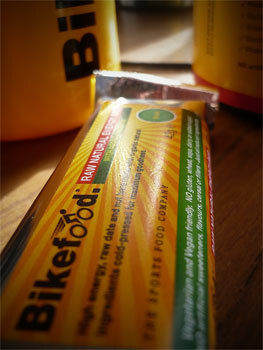 bikefood munchy bars are available from the bikefood website in a variety of quantities from £1.45 per bar. the energy drink powder retails at £10 for a 500g tub, or £25 for 1.5kg: berry or orange.